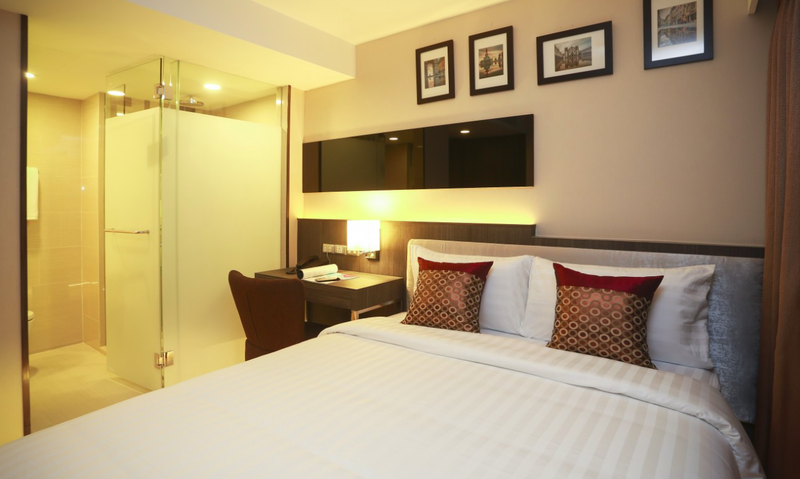 Double One Hotel is managed by Aspira and refers to Soi 11 of Sukhumvit road although the hotel entrance is hidden in the sub-soi of Soi 11 next to the entrance of Grand Swiss Sukhumvit 11 Hotel. It is a new and modern hotel with a very small lobby and not much staff. But the rooms are comfortable, although a bit small. Of course all rooms have private bathroom with shower, TV, air-conditioning, fridge and free drinking water. And of course Double One Hotel offers free wifi. I loved the good strong shower. I did choose this hotel because of its price and the only 5min walk to BTS station Nana. Good value for money. But be aware that some rooms have no window at all and that at least my room had a window ..... but the glass wall of the building is about 50cm in front of the window. So almost same as no window. For 2 nights I did not care about. Also be aware the the area (and also the street) is not really a place for family and kids. For more information see Double One by Aspira.